Spectrum/New Milford High School will open its all-school musical, “Footloose,” March 29, 2019, at 7 p.m. Following opening night, the musical will be staged March 30 and April 5 at 7 p.m., as well March 31 at 3 p.m. and April 6 at 2 and 7 p.m. at the Route 7 high school. Tickets for the production are $10 in advance and $15 at the door. Credit card purchases will incur a $1.50 fee per ticket. The box office at the school will accept cash, check and credit card to purchase tickets Mondays through Fridays from 2:30 to 4 p.m. Tickets can also be purchased at https://nmhsct.booktix.com/. 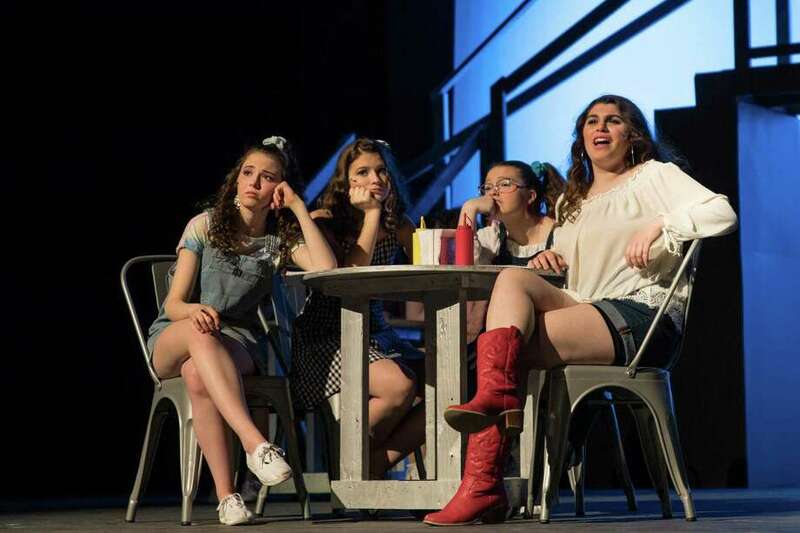 Above, from left to right, Madeline de la Perra as “Rusty,” Madison LaFontan as “Urleen,” Lily Boisvert as “Wendy Jo” and Jenna Drahota as “Ariel” dream of a hero when the girls spend time together. New Milford High School will open its all-school musical, “Footloose,” on Friday, March 29 at 7 p.m. Following opening night, the musical will be staged Saturday and April 5 at 7 p.m., as well Sunday at 3 p.m. and April 6 at 2 and 7 p.m. at the Route 7 high school. Tickets for the production are $10 in advance and $15 at the door. Credit card purchases will incur a $1.50 fee per ticket. The box office at the school will accept cash, check and credit card to purchase tickets Mondays through Fridays from 2:30 to 4 p.m. Tickets can also be purchased at https://nmhsct.booktix.com/. For more photographs, visit www.newmilfordspectrum.com.